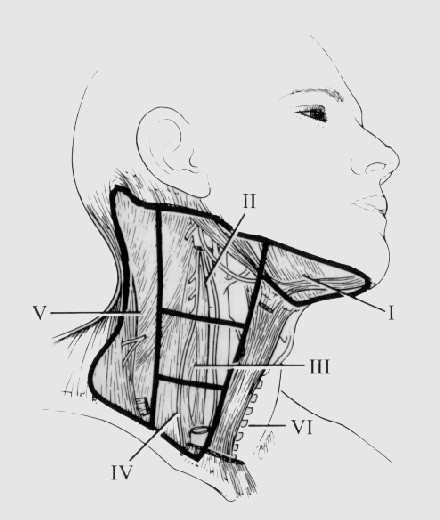 The neck is divided into 6 areas called Levels. The levels are identified by Roman numeral, increasing towards the chest. Level VII: Upper mediastinal nodes. Level VII to denote lymph node groups in the superior mediastinum is no longer used.Lymph nodes in non-neck regions are known by the name of their specific nodal groups. Level I: Submental and submandibular triangles. Ia is submental triangle bound by the anterior bellies of the digastric and the mylohyoid. Ib is the triangle formed by the anterior and posterior bellies of the digastric and body of mandible. Level II, III, IV: nodes associated with the IJV; fibroadipose tissue located medial to the posterior border of SCM and lateral to the border of the sternohyoid. Level II: upper third including the upper jugular and jugulodigastric nodes and the upper posterior cervical nodes.Bound by the digastric muscle superiorly and the hyoid bone (clinical landmark), or the carotid bifurcation (surgical landmark) inferiorly. IIa contains nodes in the region anterior to the spinal accessory nerve and IIb posterior to the nerve. Level III: middle third jugular nodes extending from the carotid bifurcation superiorly to the cricothyroid notch (clinical landmark), or inferior edge of cricoid cartilage (radiological landmark), or omohyoid muscle (surgical landmark). Level IV: lower jugular nodes extending from the omohyoid muscle superiorly to the clavicle inferiorly. Level V: posterior triangle group of lymph nodes located along the lower half of the spinal accessory nerve and the transverse cervical artery. The supraclavicular nodes are also included in this group. Bounded by anterior border of the trapezius muscle,posterior border of the sternocleidomastoid muscle, and the clavicle.